Phew, we’re coming to the end of a busy semester! In October and November, the Archives and Collections have run a total of nineteen student sessions tailored to students from different creative disciplines at The Glasgow School of Art. From Portfolio Prep to Product Design, our reading room has been host to a total of 171 students, all looking at a diverse range of papers, textiles, photographs, artwork and ephemera. 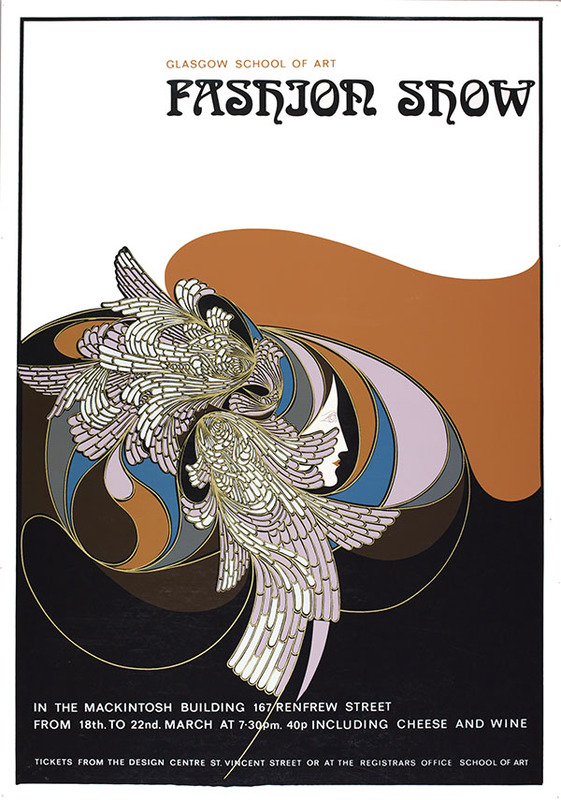 This huge poster was screen printed by Robert Stewart who was a Printed Textiles staff member between 1949 and 1981. Each student that saw this piece was absolutely amazed at the fine details lined up absolutely perfectly on every layer of the screen printing process. These beautiful pieces form part of our Needlework Development Scheme collection which features over 100 examples of needlework from different countries. 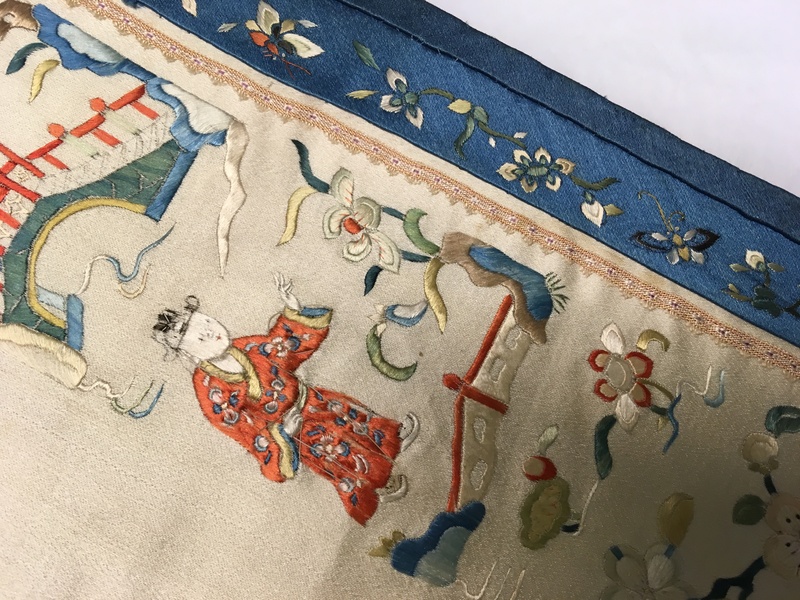 Chinese Sleeve Bands would have been sewn into the sleeves of robes for decorative purposes. The students were in awe of all those tiny stitches! Read more about the Needlework Development Scheme in a previous blog post here. 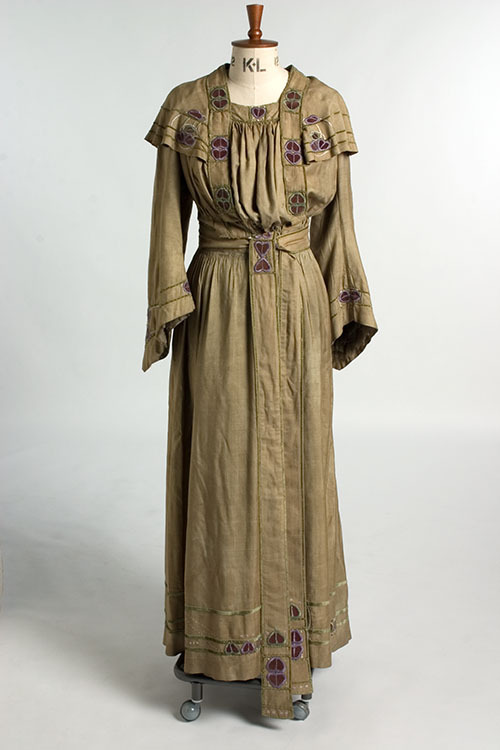 This dress was designed, produced and owned by Daisy Agnes McGlashan. It features typical Glasgow Style embroidery and, due to the purple and green colours, some believe it represents the women’s suffrage movement. We also have a photograph in the collection of McGlashan wearing the dress which you can see here. During a session with portfolio preparation students, we were delighted to discover a huge hidden pocket amongst the petticoats! 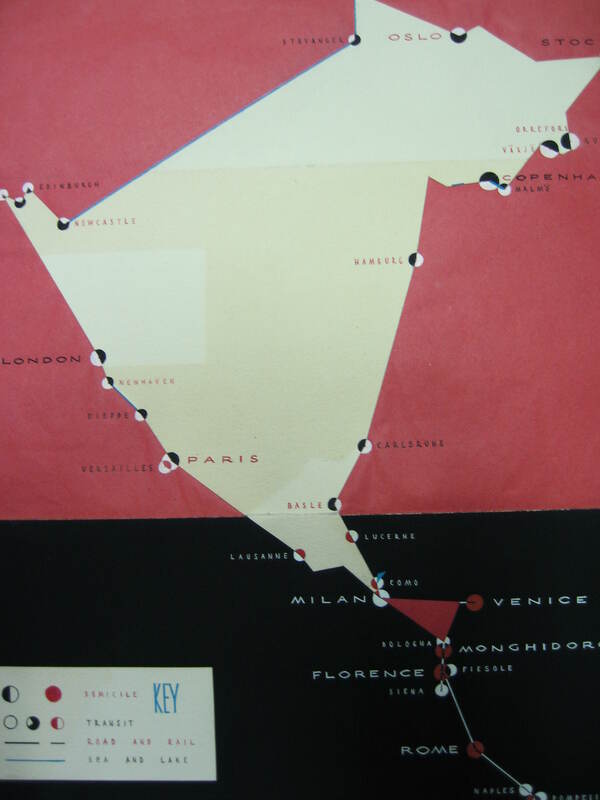 This was produced by John Walter Lindsay, an Interior Design student at GSA in the late 1940s. He was given a GSA travelling bursary of £150 to travel around Europe as part of his studies. The students were particularly impressed by this map that he made, which shows all the different places he travelled to. 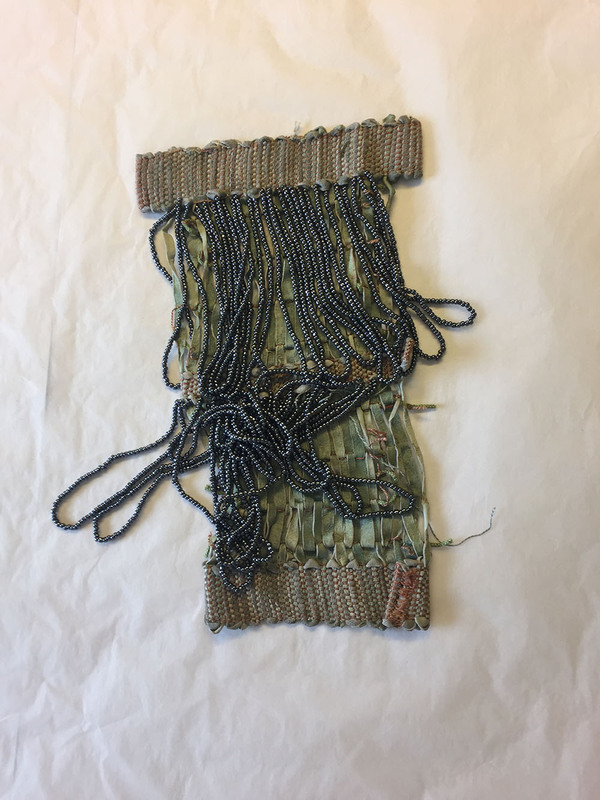 This is an example of a piece from our Textile Student Work collection which features samples from weave students in the textiles department in the 1970s and 1980s. We’re not sure who created this piece, but it’s a good example of weaving with innovative materials. The Belgian Tryst took place during World War One in the Mackintosh Building to raise money for the Scottish Branch of the British Red Cross Society and the Belgian Relief Fund. 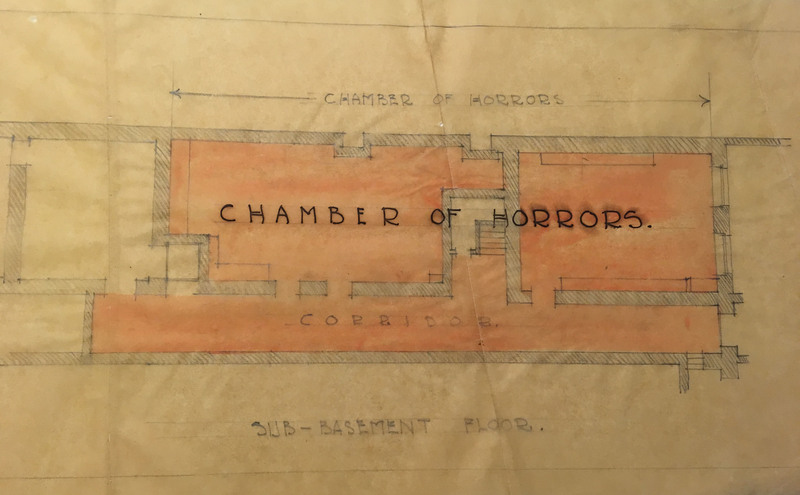 Students doing an elective on the Mackintosh restoration project as well as first year Interior Design students enjoyed comparing these plans to the original Mackintosh architectural floor plans to see what all the different rooms were used for. You can read more about it The Belgium Tryst in a previous blog post here. The level of skill involved in these hand-renders gobsmacked our first year Product Design students! 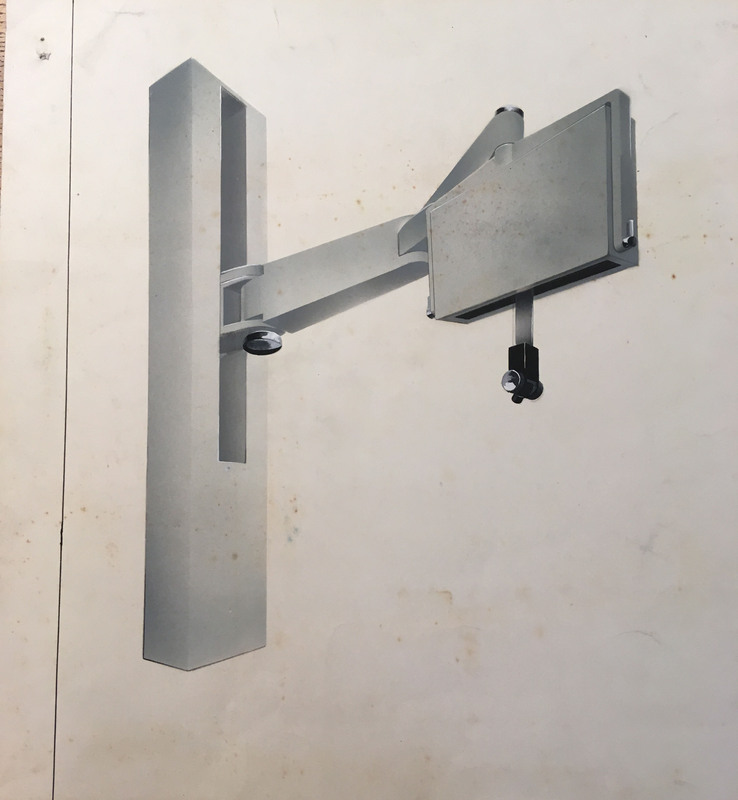 Dugald Cameron became the senior lecturer of Product Design at GSA in 1970 but he created these designs for a new ultrasound machine whilst he was still a student himself. Listen to Dugald talking about his work here. 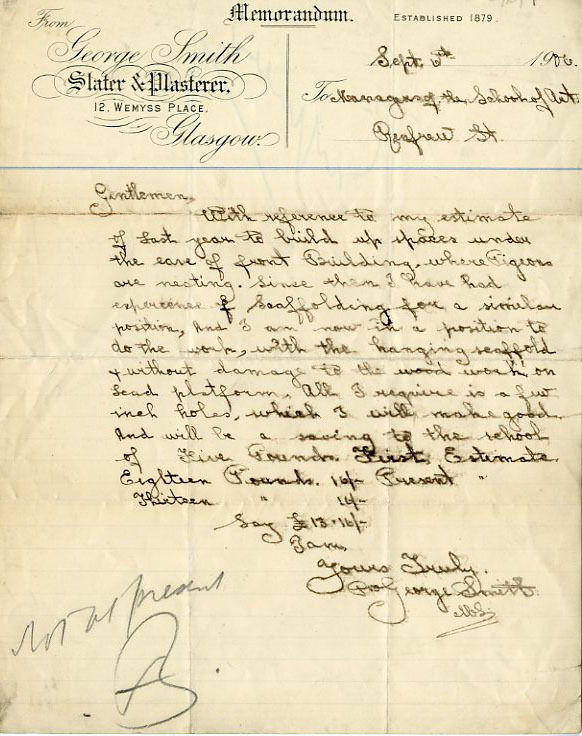 This is part of our building committee records which have been crucial to the Mackintosh Building restoration project as they build a detailed picture of the construction and extension of the building. The students found this record particularly fascinating, as the reason these eves were repaired was because pigeons kept nesting in them! 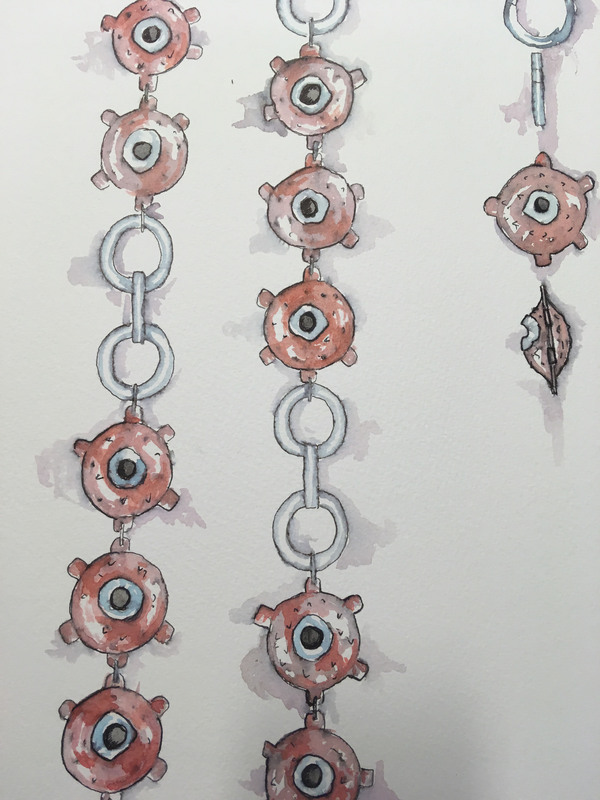 This sketchbook was produced by a Silversmithing and Jewellery student and features colourful watercolour drawings of industrial themed jewellery. Later in the book, it features the development of these pieces into bigger items designed to be worn on the catwalk. The groups that saw this item enjoyed the fact that this student had made the sketchbook themself out of aluminium sheet to fit the theme of the designs. This photograph is one of several GSA fashion show photographs from our institutional photograph collection. It was number one by far in this top ten of student picks due to the response it got from the Fashion and Textiles students. 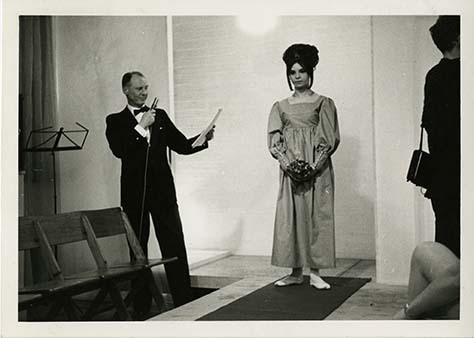 They loved the idea of a compere giving a running commentary of the Fashion Show over his microphone , and could just imagine him saying “Aaand here we have this beautiful dress with puffed sleeves designed by…”. If you are interested to find out more about our archive handling sessions, please email archives@gsa.ac.uk for more information.